Real-time analysis is an emerging business tool that is changing the traditional ways enterprises do business. More and more organisations are today exploiting business analytics to enable proactive decision making; in other words, they are switching from reacting to situations to anticipating them. One of the reasons for the flourishing of business analytics as a tool is that it can be applied in any industry where data is captured and accessible. This data can be used for a variety of reasons, ranging from improving customer service as well improving the organisation’s capability to predict fraud to offering valuable insights on online and digital information. However business analytics is applied, the key outcome is the same: The solving of business problems using the relevant data and turning it into insights, providing the enterprise with the knowledge it needs to proactively make decisions. In this way the enterprise will gain a competitive advantage in the marketplace. So what is business analytics? 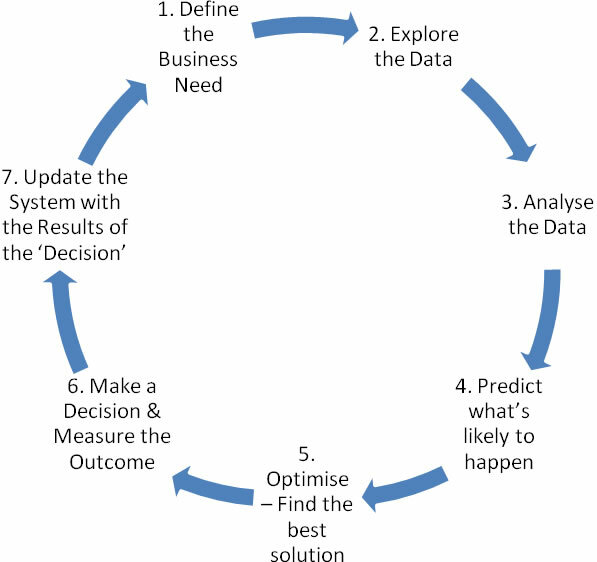 Essentially, business analytics is a 7-step process, outlined below. The first stage in the business analytics process involves understanding what the business would like to improve on or the problem it wants solved. Sometimes, the goal is broken down into smaller goals. Relevant data needed to solve these business goals are decided upon by the business stakeholders, business users with the domain knowledge and the business analyst. At this stage, key questions such as, “what data is available”, “how can we use it”, “do we have sufficient data” must be answered. This stage involves cleaning the data, making computations for missing data, removing outliers, and transforming combinations of variables to form new variables. Time series graphs are plotted as they are able to indicate any patterns or outliers. The removal of outliers from the dataset is a very important task as outliers often affect the accuracy of the model if they are allowed to remain in the data set. As the saying goes: Garbage in, garbage out (GIGO)! Once the data has been cleaned, the analyst will try to make better sense of the data. The analyst will plot the data using scatter plots (to identify possible correlation or non-linearity). He will visually check all possible slices of data and summarise the data using appropriate visualisation and descriptive statistics (such as mean, standard deviation, range, mode, median) that will help provide a basic understanding of the data. At this stage, the analyst is already looking for general patterns and actionable insights that can be derived to achieve the business goal. At this stage, using statistical analysis methods such as correlation analysis and hypothesis testing, the analyst will find all factors that are related to the target variable. The analyst will also perform simple regression analysis to see whether simple predictions can be made. In addition, different groups are compared using different assumptions and these are tested using hypothesis testing. Often, it is at this stage that the data is cut, sliced and diced and different comparisons are made while trying to derive actionable insights from the data. Business analytics is about being proactive in decision making. At this stage, the analyst will model the data using predictive techniques that include decision trees, neural networks and logistic regression. These techniques will uncover insights and patterns that highlight relationships and ‘hidden evidences’ of the most influential variables. The analyst will then compare the predictive values with the actual values and compute the predictive errors. Usually, several predictive models are ran and the best performing model selected based on model accuracy and outcomes. At this stage the analyst will apply the predictive model coefficients and outcomes to run ‘what-if’ scenarios, using targets set by managers to determine the best solution, with the given constraints and limitations. The analyst will select the optimal solution and model based on the lowest error, management targets and his intuitive recognition of the model coefficients that are most aligned to the organisation’s strategic goal. The analyst will then make decisions and take action based on the derived insights from the model and the organisational goals. An appropriate period of time after this action has been taken, the outcome of the action is then measured. Finally the results of the decision and action and the new insights derived from the model are recorded and updated into the database. Information such as, ‘was the decision and action effective?’, ‘how did the treatment group compare with the control group?’ and ‘what was the return on investment?’ are uploaded into the database. The result is an evolving database that is continuously updated as soon as new insights and knowledge are derived. What is the common tools used for step 2, 3, 4, and 5? Are they different tools? There are many tools that may be used for steps 2, 3, 4, and 5. I usually use IBM SPSS Statistics and IBM SPSS Modeler. can we use these steps while using R & tableau as well?